Exactly three weeks into the near-simultaneous bomb blasts across the country, Rapid Action Battalion (Rab) and police discovered a treasury of weapons that leave no doubt about the intention to create more terror in the future. Such huge amount of bombs and bomb making materials that resemble the ones used in 17/8. It shows that preparations to launch another attack or attacks are on and perhaps, there are more houses in or outside Dhaka where their (the arrestees') comrades are busy doing the same. 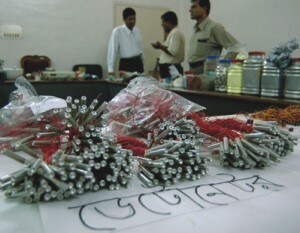 Secondly and the more frighteningly, the biggest ever police operation in the country's history and arrests of several hundred JMB cadres all over the country have apparently caused any serious damage to the militant outfit's strong organisational capability; they still have the logistics, manpower and a well functioning network to carry out future attacks. The fact that the JMB operatives are preparing for another round of attacks is a sure evidence of that. The country is therefore still vulnerable to terrorist attacks by the same group or groups and this time they may choose to inflict greater destruction than the ones did on 17/8.